Khalil:"Crime fighting runs very deep in my family." Dad Asparagus:"Nice one with the lights Bob." Bob:"My pleasure. For the next song maybe I can drive into the river!" Kids:"Yeah! Drive into the river Bob! Oh drive into the river Bob!" Pa Grape:"Don't let us die for this man's sin! And don't hold us responsible for his death, because it isn't our fault. Oh Lord, you have set this storm upon him for your own good reasons." Larry the Cucumber:"And keep my ducky safe." Larry the Cucumber & Pa Grape:"Amen." Bob the Tomato:"Am I in heaven?" Khalil:"But I still have a positive mental attitude because of my motivational tapes!" Tape Player:"You are a skilled metalworker." Khalil:"I am a skilled metalworker? Ha! I did not know that." Pa Grape:"It seems not doing anything, didn't pay very well." Pa Grape:"I'll hoist the main sail!" Larry the Cucumber:"I'll pop the popcorn!" Mr. Lunt:"I'll get the moist towelettes!" 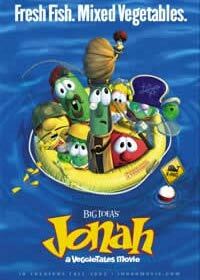 Jonah:"I'm afraid the only thing left is to be thrown into the sea!" Larry the Cucumber:"You don't have to do that! We got a plank! You can just walk off!" Jonah:"Yes, thank you. You're too kind." Mr. Lunt:"Let's put it all into cheese curls he says! No I say! We need a balanced portfolio! A little stock, a little bonds, a little cash or cash equivalents. And then maybe some snacks. But no, put it all in cheese curls he says. Man! You gotta plan for the future." Percy Pea:"Maybe it's like tofu?" Khalil:"There is a woman in Nineveh is there not? A beautiful young asparagus? She is waiting there for you no?" Khalil:"You were promised to be married, but your job is now in the way. The woman's father is the head of an international ring of camel thieves! This very day you set sail for Tarshish to deliver a message that will break the back of the camel thieves but in the process will break the heart of the woman you love!"